April serves as host to Autism Awareness month. If you or anyone you know has Autism and you’re looking for a way to show your support, StickyJ Medical ID has put together a short, yet an insightful list of five ways for you to show your support for Autism. There are a number of ways to express your support for Autism through fashion means. Online personalization teeshirt shops can be customized to say Autism and related supportive text. Additionally, you can show your support by purchasing an Autism bracelet. 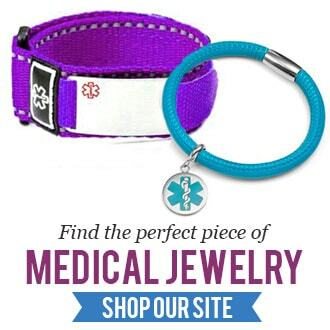 Fashionable autism bracelets are available for both children and adults from StickyJ Medical ID – an online provider of engraved and custom medical jewelry. The prices are affordable and for the month of April, all of their Autism jewelry is 15% off! Another excellent way to show your support is through monetary donations. There are many legitimate trustworthy charities for Autism that you can easily donate to by visiting their websites. Autism Speaks and the National Autistic Society are two charities that focus on the research and well-being of persons with Autism – – you can trust that the money you donate to them will be well spent. One of the best ways to support Autism is through education. Begin by learning about Autism yourself, then share that knowledge with the rest of the world. There are thousands of free educational resources available for everyone to learn about Autism. Find videos on Youtube, go to your local library and you’ll find hardcopy and digital books entirely about or related to Autism. If you’re looking to take your Autism education one step further, volunteer at programs and events with an Autism focus. Events are easy to find through charities like Autism Speaks. Visit their website and click on their get involved tab to see events that you can attend. From there, you can use Facebook to share the event with your friends, family, and community. The last suggestion is to have a night of fun with some popcorn, candy and an awesome movie that features characters with Autism. This can be one the best ways to learn about Autism and to share the knowledge with large audiences in a short amount of time. Atypical is a television show on Netflix that follows along with an 18-year-old character named Sam that is on the autism spectrum and is finding his way through life’s typical encounters. The show is fairly new and has received great reviews. Asperger’s the Movie is a documentary film about Aspergers Syndrome that has interviews with professionals with years of experience with Autism. If you do a Google search for autism films, you’ll find some good results to choose from on most streaming services. This April, focus your energy on helping others and do your part to spread Autism Awareness through education, donating your time, money and more! Will Medicare Pay for Medical Alert Systems?